I’m excited about this Twitter party I’m hosting today, you guys. It’s with a website called Blinq.com – have you heard of them or shopped with them before? They offer all sorts of products at discounted prices. Basically the items they are selling are returned (but not defective – many new in box) or refurbished. You can get products like this at a fraction of the cost you would pay for new. You can RSVP here on Facebook. 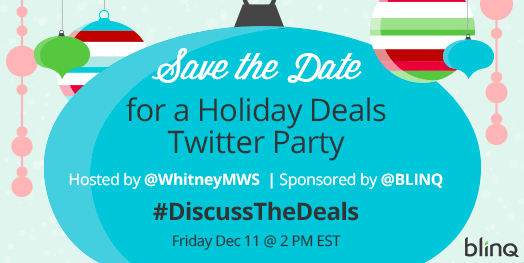 I’ll be hosting live with the hashtag #DiscusstheDeals – follow me (@WhitneyMWS) and Blinq (@blinq) and the hashtag to participate. Gift cards will be given away!